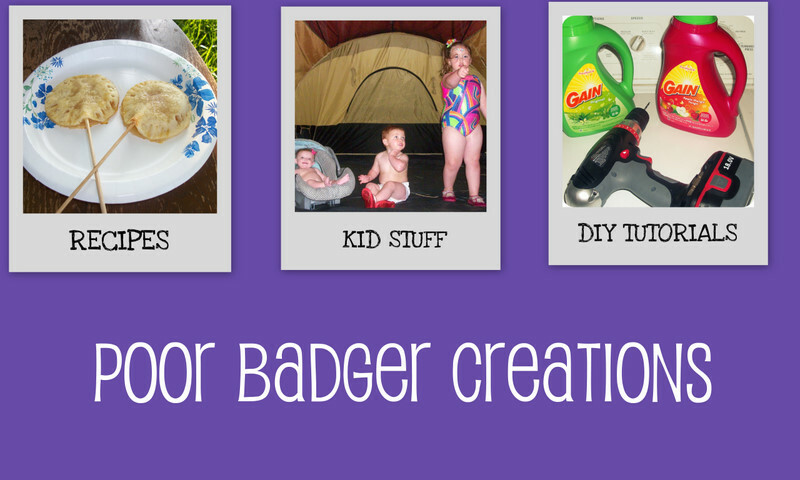 Poor Badger Creations: Poor Badgers first product review and first lesson on being a DIYer! Poor Badgers first product review and first lesson on being a DIYer! Yea! Excited to do this and I want to just jump right in. One of the main principles of Poor Badger was to be crafty on a dime. God Bless Martha Stewart, but we all can not afford her craft supplies. So I am excited to do this product review to let others know some of the crafting tricks of the trade. I'm going to take a moment and say very loudly; 'God bless spray paint!' If you haven't visited the spray paint isle, you have no idea how things have changed. Spray paint is not just for men, it comes in WAY MORE colors than it did 10 years ago, and the quality has changed by leaps and bounds. Spray paint has become the new DIYers trick of choice. Wood, plastic, wicker, glass, and almost any other surface type can be spray painted. There are also spray paints that replicate mercury glass, various metals, and gravely textures. We found this wonky wicker stand at a yard sale for $1!!! I used the Krylon from our local Wal-Mart (around $4). Make sure you clean any surface before you spray paint it, and also do the spraying outside. We don't need you sniffing the funny fumes. After just two cans, our one dollar find became the cutest stand for Gumball the underwater hamsters cage. Visit your local Goodwill or yard sale and buy those pieces of furniture that looks neat and hit it with some color. Best DIY tip you'll find! The next review is for the Martha Stewart acrylic paint line. You can find them at Micheal's craft store. They cost around $3 per bottle and you can ALWAYS find coupons for the store or Martha products online or in her magazine. I found these at the same store for a buck and wanted to use them as my tester. I thought copper would look nice. In addition to the crosses, we found this picture of Jesus at a yard sale for $1. The frame was in poor shape and had stickers all over it. I knew with some DIY TLC, it would turn out nice! The Krylon also gets a good paw up because of the low price point, HUGE selection, and the ease of use. Not too shabby! Besides the product review I really wanted this to be a helpful craft lesson. Goodwill, flea markets, and yard sales are the BEST places to find things for your home. Now you know how to spiff it up, infuse it with YOUR style, and help the piece fit into your home with either spray paint or acrylic paint. Barb, love, love, love the wicker stand and the crosses and picture! You are very talented! !